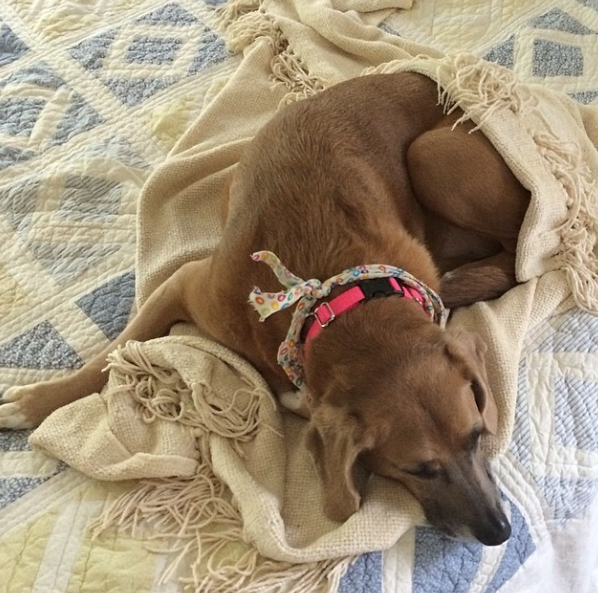 We aren’t eating a lot of pasta in our house at the moment, for the plain and simple reason that the Southern daughter is home for the summer, she’s completely into healthy high-protein/low-carb eating, and she is dragging us along with her. So whenever she is out with her friends, we sneak in a plate of pasta…but since they are now few and far between, I’m trying to be a little bit exotic. While still spending a minimal amount of time in the kitchen. 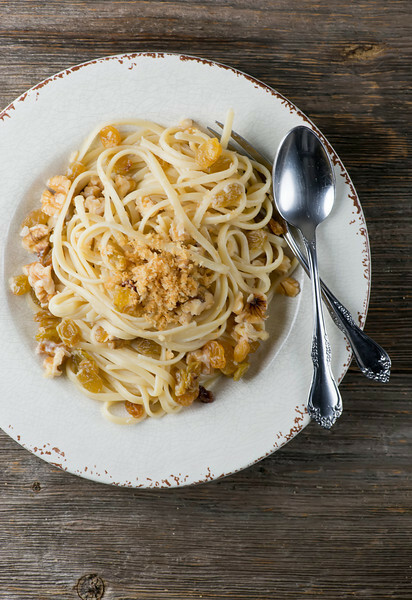 Which is how this pasta with golden raisins and walnuts done got born. This is one of those quick and easy pasta dishes where you save some of the pasta water to mix in at the end to make a very light sauce. And here’s the part where I tell you again, you gotta Salt That Pasta Water. Be brave. Toss the salt on in there. Pasta water should taste like sea water. I promise you your pasta won’t be too salty – it will be just the right amount of seasoned, and your pasta water will be full of pasta starch and salty wonderfulness. Pasta water is a wondrous thing. Anyway, while your pasta water is cooking away in its salty bath, toast up some bread crumbs in a little olive oil and salt. I like to use panko bread crumbs for this, but any old bread crumbs will do, including a piece of bread you have whirled in your food processor. Once they are nice and brown and crispy, set them aside until your pasta is done. Now put your drained pasta into a skillet with the raisins, some chopped walnuts (which you can toast in a skillet or have untoasted. I went with untoasted, but you be you, walnut-wise), some grated parmesan cheese, and just enough of that pasta water to make a night light sauce. I usually save about a cup, and pour it in 1/4 cup increments until things are looking good. Now serve it up on warmed plates, and top it with some breadcrumbs. I’m feeling very confident about having my occasional plate of pasta, given that we are mostly eating protein type of stuff with the Southern daughter, AND I am wearing an Up24 band that is tracking all my many steps. Here’s what my groovy Up band looks like, in case you are interested. I am trying for 10,000 per day, unlike some other family members I could mention. Not that I am naming names. Cook pasta in heavily salted water according to package directions. Save a cup of the pasta water and drain the pasta. While the pasta is cooking, make the bread crumbs: heat the olive oil over medium high heat, then add the bread crumbs and the salt. Stir until bread crumbs are golden and crisp. Set aside. Put drained pasta into large skillet. Add raisins, walnuts, cheese and enough pasta water to make a light sauce. Toss with tongs until everything is mixed through. 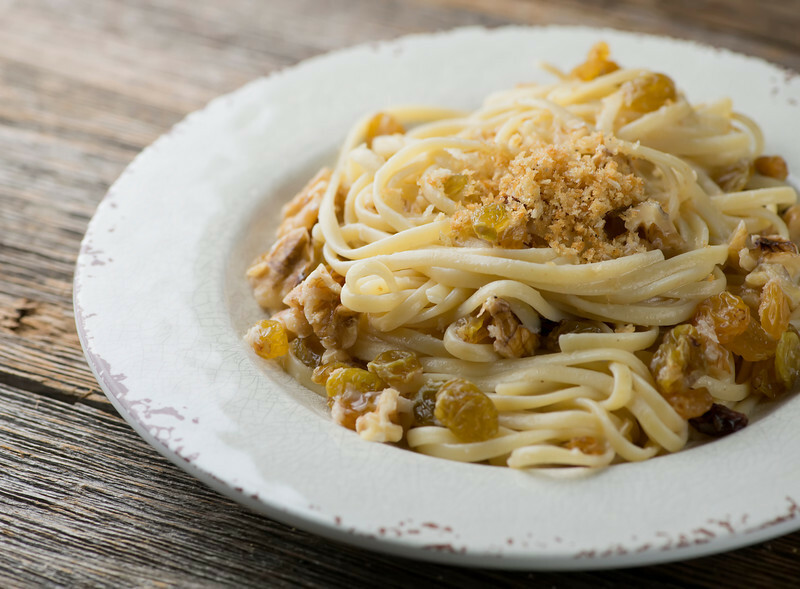 Divide pasta among warmed plates, top with bread crumbs and serve. I love your page! I start my first day being pescetarian tomorrow !